Renting a storage unit provides a number of benefits, from freeing up space at home to finding a safer more secure storage area that limits the possibility of damage to your belongings. Storage units provide special conditions designed to keep items dry and temperate, allowing you to store everything from antique furniture to special documents safely. They are also highly secure, making it safer than storing expensive, rare items than at home. 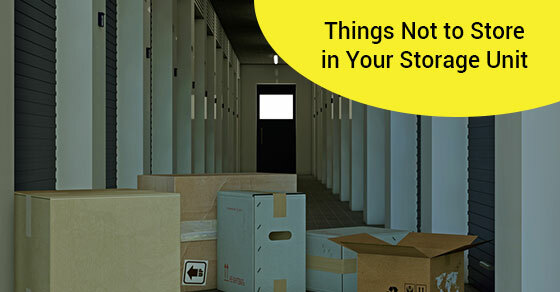 Most people assume they can store whatever they want in their storage unit. After all, they are paying for it, right? Wrong. There are rules associated with storage units which are designed to keep everyone’s belongings safe and to protect staff at the site from danger. Storing food at a storage site can lead to a lot of issues. The first is that even when contained properly, all food has the potential to spoil. Spoiled food will create an odour that will not only permeate the items in your storage unit but also spread to the surrounding units. The smell of food can attract pests, which in turn could lead to an infestation at the storage facility. This would be devastating to all of the units that suffer from the effects of pests, including the spreading of pest feces and gnawed belongings. This infestation could then even spread to the homes of storage unit renters when pests are brought home in stored items. Yuck! And ‘food items’ also includes pet food and birdseed. Along the lines of the above, a lot of scented products like scented hygiene products, deodorants, shower gels and conditioners can attract pests. Enough said. This might seem like an odd one but wet items that remain wet or dry slowly tend to maintain mould and mildew growing moisture. Mould and mildew will spread throughout your items, which can also produce toxins in the air. When you open your unit, these toxins can be released, and you will breathe them in. You will also then bring home the mould and mildew should you take any of the mouldy items home. Last but not least, mould can cause irreparable damage to belongings and end up costing you a fortune. We’d like to think this is obvious, but not only is this a no-go, it is inhumane and against the law. Never, ever leave an animal in your storage locker. This might seem like a good way to kennel your pets if you are taking a short trip, but it is unsafe and cruel. There are many reasons plants are not allowed in storage units. From your own standpoint, they need light to survive so storing them in your unit is just silly as they will die. From the standpoint of the facility, plants are wet and can produce moulds that are toxic. So, you might be thinking, how will you even know my belongings are stolen? The truth is even the facility won’t know. However, it is illegal to store possessions that you do not own, or that the owner has not provided express permission for you to store for them. This includes all ill-gotten gains. Police can search your unit with a search warrant at any time, so keep that in mind as well. This does not mean stolen money. It means any money. Money is not covered under storage insurance policies, so you don’t want to keep your money at a storage facility. Keep it in the bank. If you need to store a vehicle, you will be asked to provide registration when you bring the vehicle to the storage site. Storage facilities don’t offer insurance on vehicles. Vehicles that are not registered or warranted cannot be stored. You can also not store uninsured vehicles in a storage unit, even if you are specifically renting a vehicle space. Many storage facilities will also do follow up with the ministry to confirm registration. Even if it’s a registered hunting gun, or ceremonial and vintage/artifact weapons are not permitted. Self-storage does not include yourself! Many people have considered using their storage unit as a temporary housing solution. Rent is cheap and it is a dry place where you can remain safe. However, living in a storage unit is not allowed. Facilities have strict security that will look for signs that someone is living in a unit and you will be ‘evicted’. However, this is also designed to protect your belongings and unit from being turned into a living space for someone else, so that is a good thing. Your storage unit will provide a secure place to store a wide array of items. However, when renting a storage unit it is always a good idea to review the policies just to be safe. First of all, you do not want to find your belongings damaged because you stored something improperly or added items that are not permitted at the facility. Second, you also do not want to get kicked out from your unit because you did not realize something was not allowed. It’s easy to make an honest mistake and store something that you did not realize was on the forbidden list. A discussion with your storage facility will also provide you with helpful tips for storing your belongings to protect them from damage. If you would like more information on renting a storage unit, call Jiffy Self-Storage at 416-745-4339 or contact us here.